The Southampton Art School has been offering art classes for adults and children since 1957. Classes taught by qualified art instructors are in session primarily during the spring, summer and fall months. Because the Southampton Art Society is a non-profit organization we strive to make our classes financially accessible for all people and nurture partnerships with others who assist us in making this possible. A network of art supporters in our community, including our municipality, rental managers, suppliers, instructors, artists and volunteers work together with the Art School, to help make this happen. The Southampton Art Gallery and Shop was established in 1999 in the Old Town Hall, next to the Art School. The Gallery’s mandate is to promote cultural enrichment in the community by providing a space for regional artists to exhibit and sell their work. 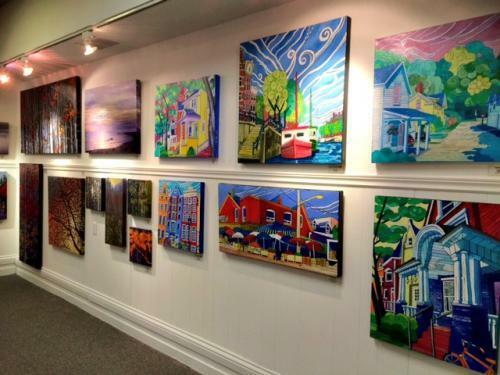 Since 1999, we have acquired over 30 gallery artists and exhibit artwork from artists all over Grey Bruce. We now proudly host an annual emerging artist Juried Exhibition, feature rotating exhibits and themed art shows, provide Christmas in the Gallery, and offer an extensive selection of art supplies. Located at the main intersection in Southampton, in the old town hall building.